Author: Gough, Laurence Set In . . .
A mysterious figure who held up a whole series of banks, shot a man for his briefcase, and then disappeared. Greg is the bank robber, the womaniser, the man with the plan. But when he becomes a killer, his plans begin to unravel. The briefcase he stole is full of pages and pages of numbers and he’s got no way of finding out what they mean. Still, Greg is skilled in special effects and with a new face created for every heist, there’s no way anyone can find him before he finds answers. But Greg wasn’t always so good at his job. Maybe the key to his true identity is lurking somewhere in his past? If so, it’s up to Willow and Parker to find it and use it before Greg strikes again. 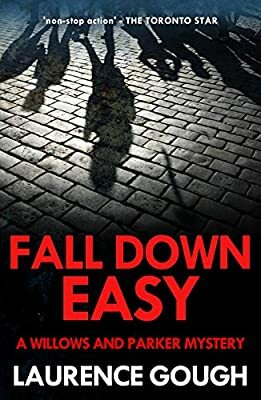 Nominated for the best crime novel by the crime writers of Canada, Fall Down Easy is an epic murder mystery. Laurence Gough lives with his wife and two children in Vancouver. He is the author of twelve Willows and Parker mysteries. The Goldfish Bowl , won the Arthur Ellis Award for Best First Novel from the Crime Writers of Canada. Other is the series: Death on a No. 8 Hook; Hot Shots, winner of an Arthur Ellis Award for Best Crime Novel of the Year; Serious Crimes; Accidental Deaths; Fall Down Easy; Killers; Heartbreaker; Memory Lane; Karaoke Rap; Shutterbug; and Funny Money . His international thriller, Sandstorm , won the Author Award (fiction) from the Foundation for the Advancement of Canadian Letters in 1991.